Happy Cinco De Mayo Everyone! Today my day is going to be spent on a soccer field so my family got together last night. We had lots of yummy mexican food but most of all we spent precious moments together…. My grandfather tried to get on the trampoline with the kids and all of us women about had a heart attack thinking he was going to hurt himself. The kids thought it was great though (love you grandpa)! One of the things I made for the night was this Oven-Baked Arroz Con Pollo. I got the recipe out of the Spring Phyllis Hoffman Celebrate magazine. 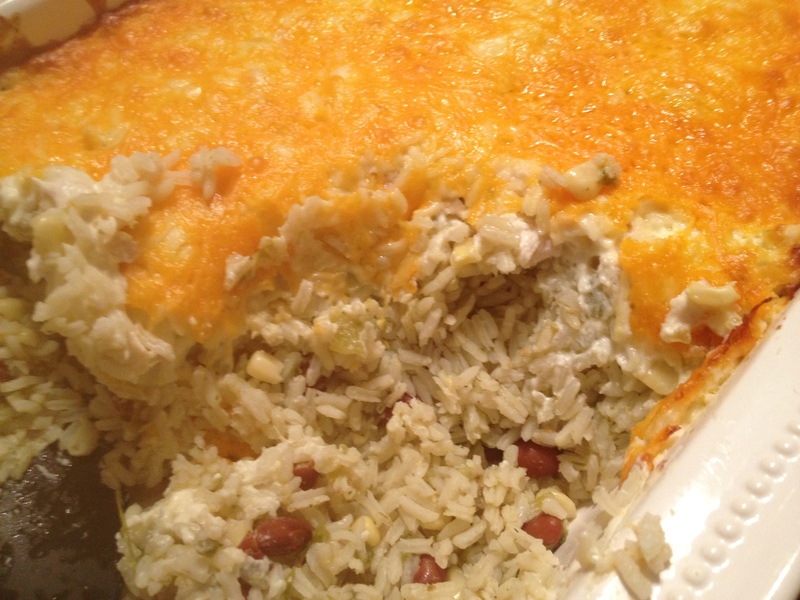 This Oven-Baked Arroz Con Pollo was very good, full of rice, beans, corn, chicken, chiles and topped off with cheese! To prepare rice: In a large saucepan, combine broth and water. Bring to a simmer over medium-high heat. Add rice, onion, corn, and garlic. Return to a boil. Reduce heat to a simmer. Cover, and cook for 20 minutes, or until rice is tender. Stir in pinto beans and salsa verde. 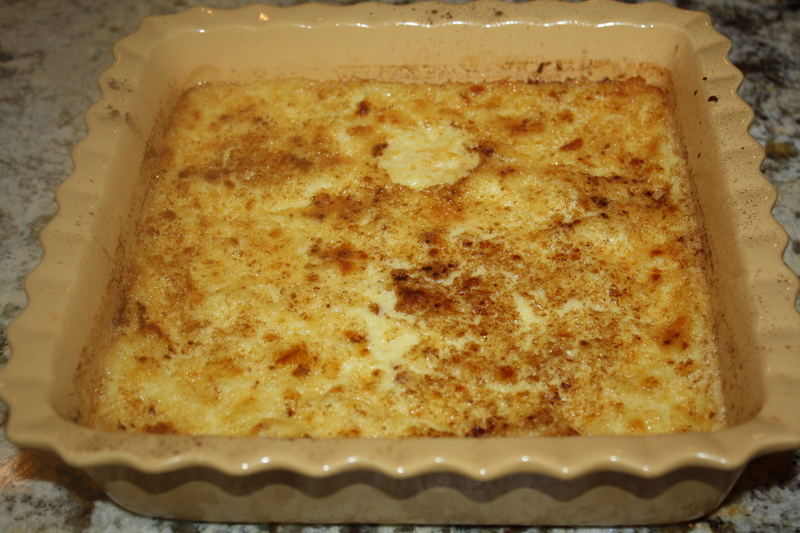 Spread in a single layer in a 13×9-inch baking dish. To prepare chicken: In a large saucepan, melt butter over medium heat, Add flour to melted butter, stirring until smooth. Cook for 2 to 3 minutes, or until light brown. Add milk, stirring until smooth. Cook for 4 to 5 minutes, or until thickened, stirring often. Add sour cream, stirring until smooth. Add chicken and chiles, stirring well. 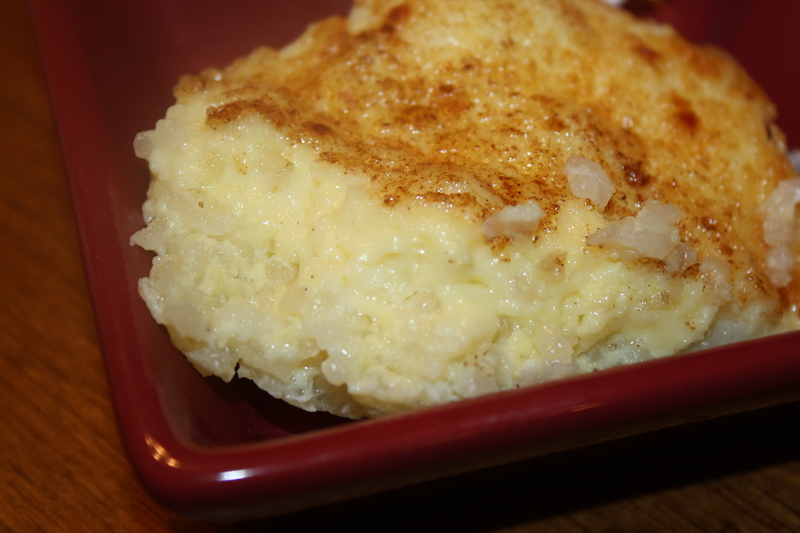 Spread in a single layer on top of prepared rice. Top with cheeses. Cover, and bake for 30 minutes. 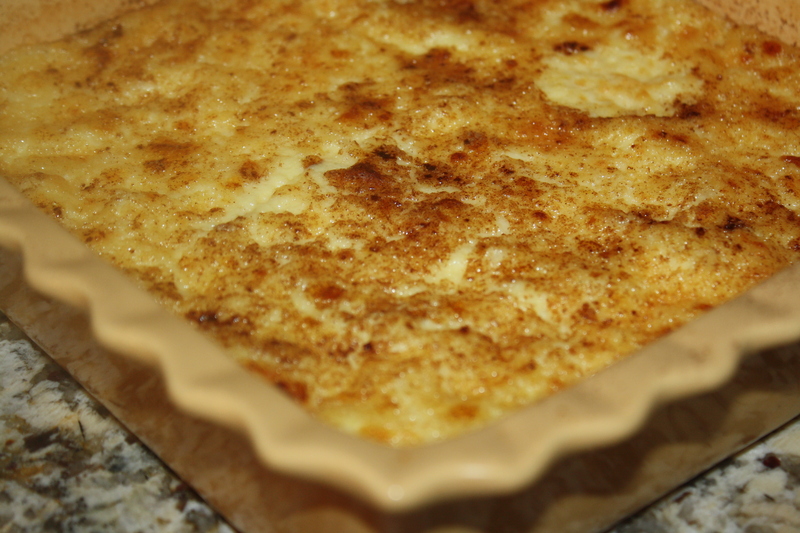 Remove cover, and bake for 10 to 15 minutes longer, or until cheese is lightly golden and edges are bubbly. First I fry the bacon and onion until the bacon is crisp (over about medium high heat). Then drain about half of the bacon grease into a glass cup (that way you can add some more if your rice is to dry). Add your cooked rice to the bacon and onions. Mix all together. There should be a little shine on the rice. Cook (fry) for about 5 minutes. Season with salt, pepper, and soy sauce to taste. Remember the soy sauce is going to add saltyness, so start off with a little bit at a time. You could always add more but you can’t take away. Pour the beaten eggs over the rice. Leave alone for about a minute then stir the egg into the rice. Cook until the egg is set. Add the green onion and mix all together. Taste again, add salt, pepper, or soy sauce as needed. Remove from heat and serve. Enjoy! I add a little more diced green onions over the top of my husbands because he likes more than the kids do. I have always been a fan of rice pudding. So when I came across this recipe in a cookbook (Taste of Home’s Contest Winning Annual Recipes 2006) I knew that I wanted to try it. 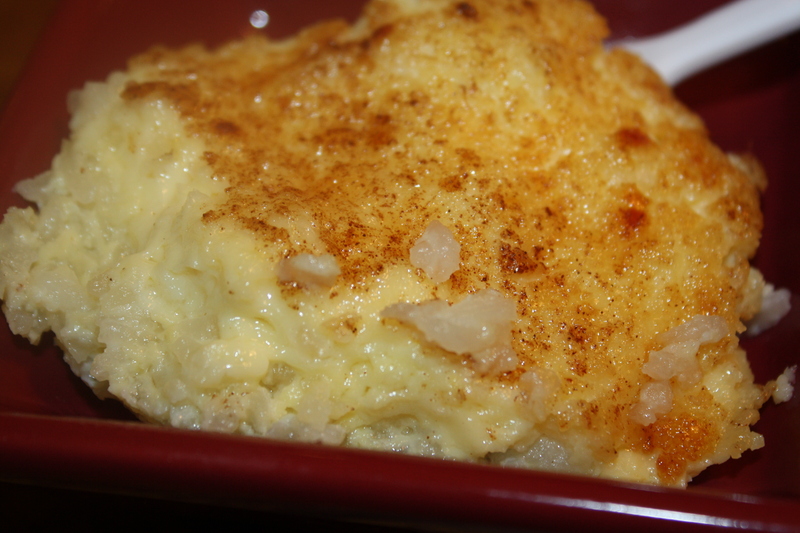 I am so glad that I did because this rice custard was delicious!!! It was perfectly sweet and rich. 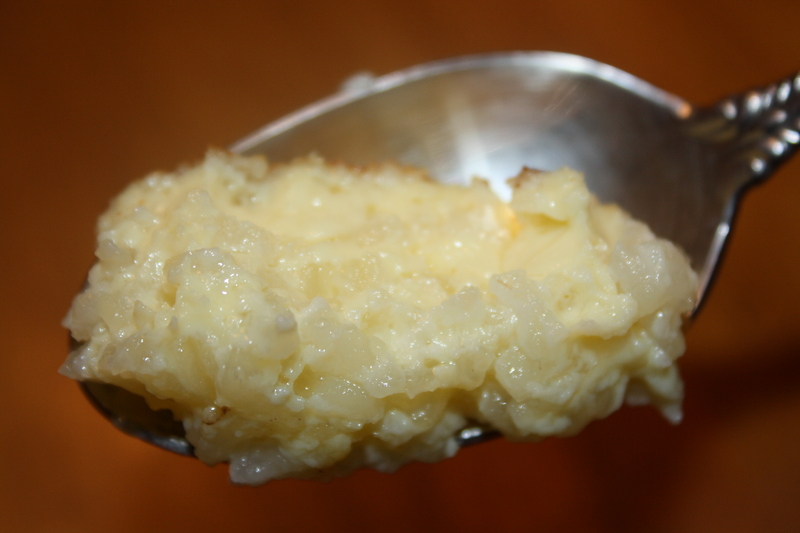 By far the best rice pudding/custard that I have ever had! I had my Aunt and kids over for dinner and this is what I served for dessert. Everyone loved it and polished it off in seconds. As a matter of fact I think next time I will try to double the recipe. I adapted the recipe just slighty to our tastes. In the top of a double boiler, combine rice and 2 cups milk. Cook, stirring occasionally, over boiling water until rice is tender and most of the water has evaporated, about 45-50 minutes. Stir in butter.